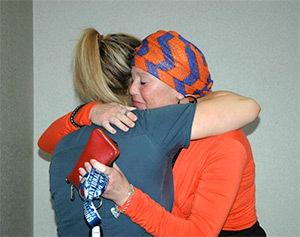 Cancer brought survivor Cari Schaefer and nurse Sarah Noordam, BSN, RN together in Cari’s treatment. “Sarah had just lost her mother to cancer and was helping me throught the broken heart I have due to this disease taking me away from my children,” Cari wrote in nominating Sarah for the nursing DAISY award. Sarah says “I am drawn to cancer patients. They are fighters and want to get better.” The cancer patient and mother formed a team with the nurse and daughter.